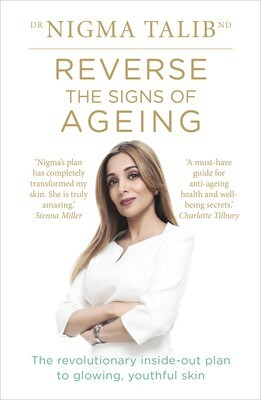 For years, world renowned naturopathic doctor, Dr Nigma Talib, has been solving skin problems and answering the million dollar question, `what can I do to look and feel younger?' From every day patients with chronic skin conditions such as acne and psoriasis, to high profile names who need to look picture-perfect on the red carpet, Nigma has seen the powerful results of her inside-out approach that starts with the gut. Now, for the first time, she shares the secrets to youthful-looking skin in her complete, 360-degree guide that everyone can adopt into their everyday life and enjoy. In this effortless, but eye-opening journey, you'll discover how to make a remarkable difference to: Rejuvenate ageing skin Reduce the appearance of fine line, wrinkles and sagging skin Solve persistent skin problems Control hormones that could be wreaking havoc on skin This is not just an anti-ageing plan. This is a new life plan. We can't stop the clock, but we can tip the scales in our favour.